The Yellow Book by Zimey Rinpoche, with the original title: Thunder of the Stirring Black Cloud: The Oral Transmission of the Intelligent Father, was written in 1973 and first published in 1974. The book marks the culmination of the controversy between the Dalai Lama and Shugden-practitioners. In 1996 the Dalai Lama announced that Dorje Shugden was “an evil spirit” detrimental to the cause of a free Tibet and so he began to request that those who worshiped Shugden no longer attend Tantric initiations from him. But was Dalai Lama himself a Shugden-practitioner? And are the modern Shugden sects sponsored by the Chinese Government? 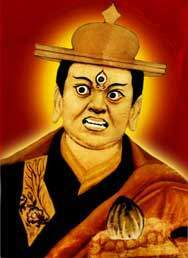 This story is a long an interesting thriller including murder, conspiracy and hundreds years old conflicts centered around opposing tantric teachings among the many Tibetan sects, read about it at WikiPedia: http://en.wikipedia.org/wiki/Dorje_Shugden_controversy. If you are interested in the background you should download this excellent and balanced book by Ursuala Bernis on the topic: Condemmed to Silence. The Yellow Book marks the culmination of the controversy between the Dalai Lama and Shugden-practitioners. I just read what is described on this page as “the excellent and balanced book by Ursuala Bernis on the topic: Condemmed to Silence.” It is neither excellent nor balanced but an absurd distortion of the truth – nothing but propaganda to attack the Dalai Lama’s opposition to sectarian spirit worship based on misplaced adoration of lamas that praised their protector for killing people who chose to exercise their religious freedom by taking teachings outside of the Gelug tradition.